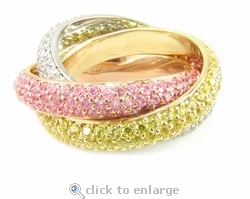 Our Trio Tri Color Pave Set Cubic Zirconia Rolling Ring Trinity Ring Russian Wedding Ring Eternity Band features three interwoven bands in 14k white gold, 14k yellow gold and 14k rose gold with coordinating lab created laboratory grown simulated white diamond, canary diamond look and pink diamond look cubic zirconia stones. The Trio Eternity Rolling Ring is like no other ring you have ever seen or worn. It features three pave encrusted bands that make a united eternity band. Each band is 4.5mm wide and the entire ring is encrusted with over 400 pave set round diamond quality cubic zirconia. The total carat weight is approximately 6 carats. 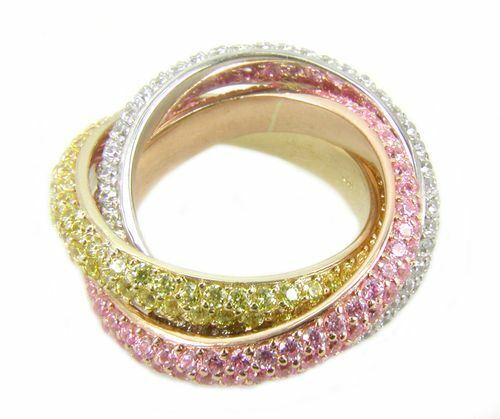 This triple eternity band ring can be made in various metal and stone color combination from all one color metal to the tricolor shown or all white diamond look stones to the canary diamond look, pink diamond look and white combination shown here. 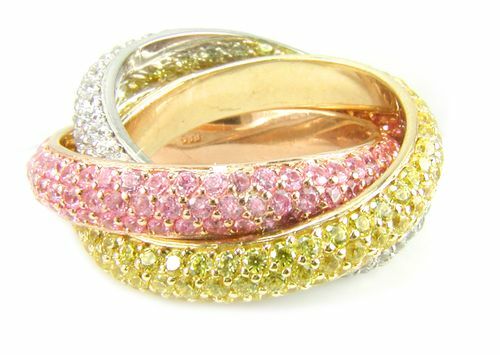 The ring shown here has three bands one in 14k white gold set with all white diamond look stones, one in 14k yellow gold set with canary diamond look stones, and one in 14k rose gold set with all pink diamond look stones. This item is custom made to your finger size and is a special order. Smaller and larger finger sizes available via special order. Please call us directly for special order pricing at 1-866-942-6663.